A massive TV that won’t fit in your living room and magically appears from the ground! 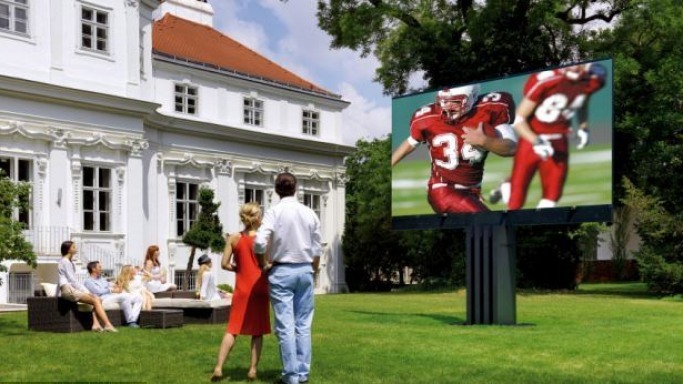 Austrian firm C SEED Entertainment Systems was proud to unveil the world’s largest and most expensive outdoor television with a 201-inch (16.75ft) LED screen. It was designed by Porsche Design Studio in association with Lighthouse Technologies. The C SEED 201 contains more than 750, 000 LEDs capable of creating 4.4 trillion colors and offer quality pictures especially during outdoors. Hidden in an underground storage, it rises and unfolds itself from the ground through a remote control. Flexible as it is, it rises from the ground in a measly 5 seconds and unfolds itself after 40 seconds. It comes with a built-in 15-speaker audio system, built-in weather station that allows itself to fold up and retract into the ground during heavy winds and rain and built-in biometric fingerprint sensors which does not allow non-owners to use the TV. It is waterproof, height adjustable and can rotate 270 degrees, giving audience an awesome viewing experience. Alexander Swatek and Edourdo Saint Julien-Wallsee were the brain behind this successful wizardry. "Our goal was to develop a design concept that turned the unfolding process into a special effect. We wanted to make sure that the C SEED 201 conveyed a sophisticated aesthetic in every phase of its movement. It starts as an obelisk rising from the ground, then opens up with a butterfly-like motion," said Roland Heiler, CEO of Porsche Design Studio. The gigantic C SEED 201 is seen to only fit among private yachts. It costs $680, 000 or equivalent to four Porsche 911 cars. The company globally produces 25 units annually which give it a sense of exclusivity among the owners. Meanwhile, in Britain, their biggest TV is the LG Ultra HDTV with an 84-inch screen and went on sale for only $37, 000 last Christmas.